Your gift doubles the amount of healthy food for families like Marquel’s. Access to fresh, healthy food is a basic human right. But for thousands of individuals like Marquel, being able to afford fresh fruits and vegetables is just out of reach. 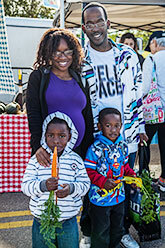 Thanks to your support, SFC programs like the Double Dollar Incentive Program (DDIP), allows families like Marquel’s to visit the SFC Farmers’ Markets and double the dollar amount that they can spend on fruits and vegetables at the market. Won't you continue to support access to healthy food for everyone in our community? Your support brings direct access to locally-grown food to the children and families in Austin who need it the most. From our family to yours, thank you for your investment in SFC! P.S. Tell a friend about this campaign and help us support the future of our local food community.